Unexpected animal friendships are some of my fave videos. Yes, I’m that person who always shares on Facebook the video of a goat and dog frolicking, or of a pig snuggling with a mini cow. And let’s not forget the ol’ cat and dog combo — because not all of them fight. 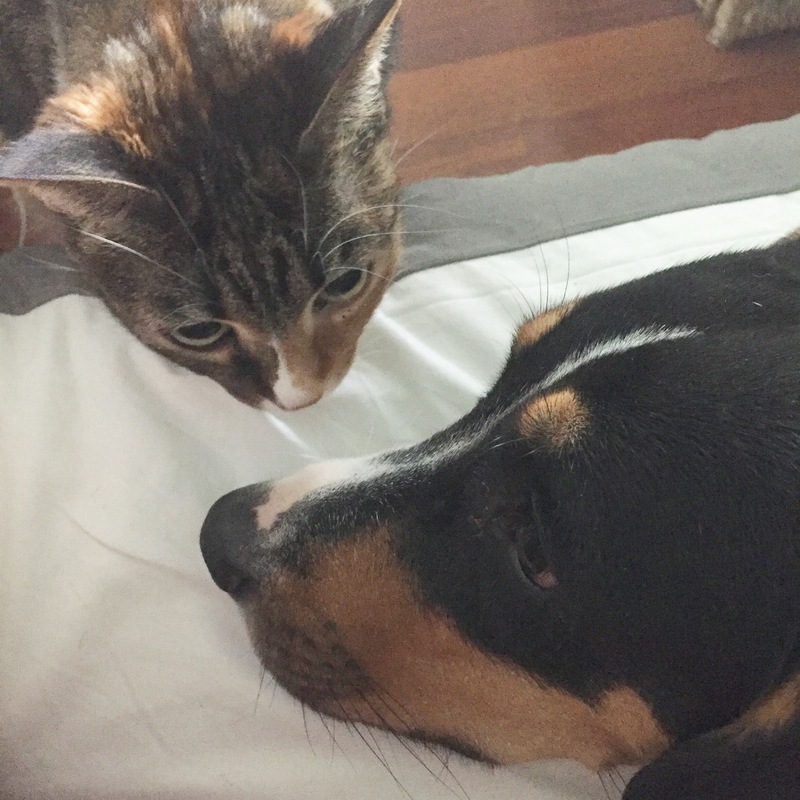 I adopted Billie Jean recently and a big factor in my decision was how well she hangs out with the cats. She generally ignores them. If she walks into the path or gets in the face of one of the cats, the cat will usually hiss, and Billie Jean usually pauses and either finds another route or scurries by. One cat is more curious, and the other just goes about his own way and ignores BJ. But my dream would be for the cats and Billie Jean to be besties. 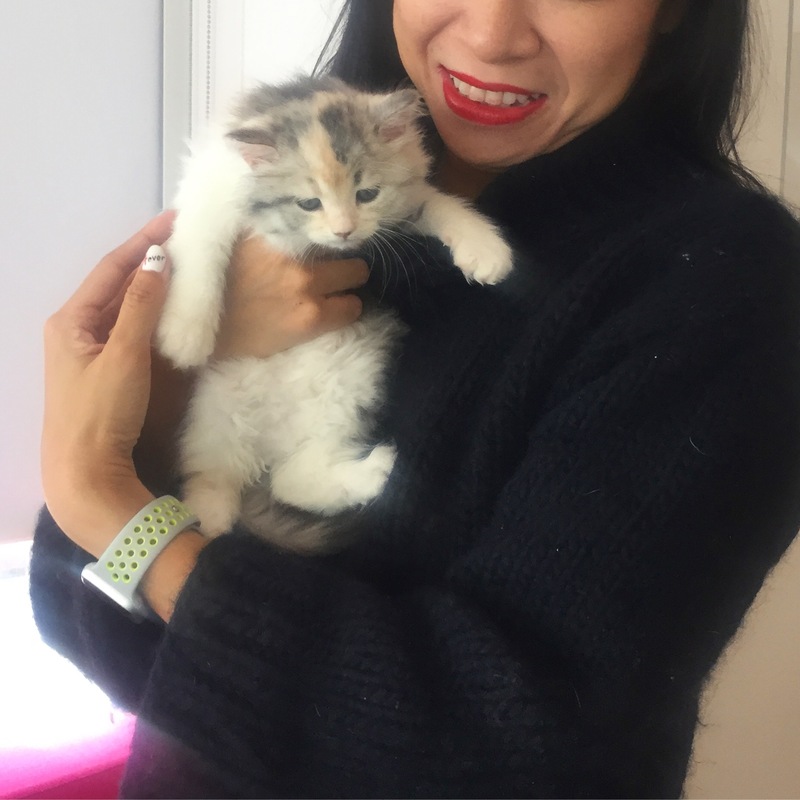 Last week, I had the chance to meet with ” the cat whisperer” aka cat behaviourist and author Mieshelle Nagelschneider at an event held by Arm & Hammer, so I took the chance to ask how I can help the cats learn to love Billie Jean. She wasn’t concerned about the hissing given I have only had Billie Jean about a month, the hiss is just the cats giving a warning, she said, and it’s still early days. The best way to help them all get along, she said, is to create a group scent. When you have multiple cats, they create a comfortable environment by creating a group scent — this is what they’re doing when they rub up against each other, furniture and you. I can help Billie Jean get welcomed into the household by creating a group scent by putting a pair of thin socks on my hands and rubbing the face of each animal in sequence, and repeating this ritual. 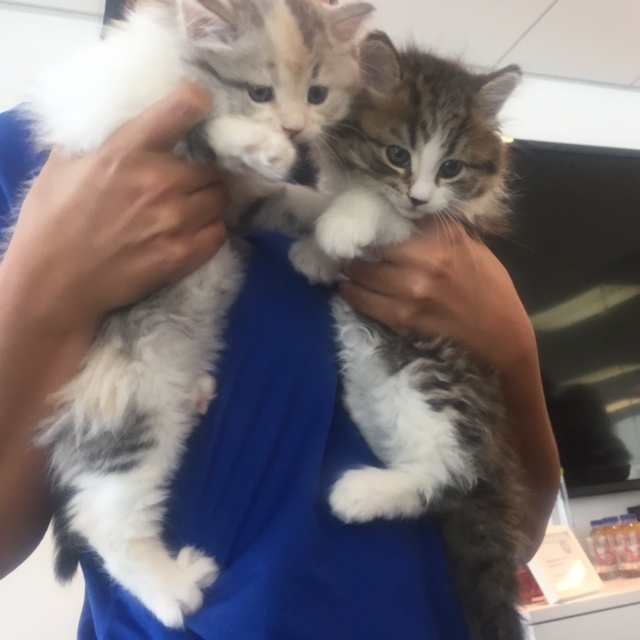 The other tactic she suggested I try is a counter conditioning exercise: play with the cats in near proximity to Billie Jean, and that way with their dopamine levels going up as they happily play, they’ll associate more of those feel-good feelings with the dog’s presence. I haven’t yet had a chance to put these tactics to use for long but I can’t wait to see if this gets them all to love one another and snuggle, which is pretty much my life goal right now. The litter box should be uncovered. Cats don’t seek privacy when doing their business; an open litter box allows them to feel safer as they can more easily able to escape quickly if need be (this goes back to their cat instincts and living in the wild). Scoop the litter box once or twice a day, or else your cats may stop covering their business in the litter box. Stay tuned to my Instagram for updates on the progress I make with Billie Jean and the cat love!